The question of which type of canned tuna is better – in oil or water – is mostly a question of personal preference. Although, two main considerations one could take into account when deciding between the two involve the overall resulting taste and nutritional benefits. Traditionally, canned tuna was packed in oil, not water. It wasn’t until the not so distant past and the emergence of the health and wellness trend that canned tuna in water was introduced. One of the biggest disadvantages to canned tuna packed in oil, whether it is sunflower oil or olive oil, is the number of calories per can. Most oil packed canned tuna has double or triple the number of calories compared to tuna packed in water. Another consideration is that the oil used in the canned tuna tends to bond with the natural fats of the tuna and when drained, much of the nutritional benefits of these natural fats are drained away with the liquid as well. 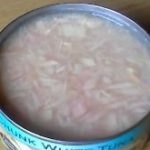 Canned tuna packed in water doesn’t have any of the same issues, so one might conclude that canned tuna in water is a healthier choice. Taste is completely a personal preference. Some people like the texture of canned tuna in oil and some don’t, finding it too slimy. However, canned tuna in oil is sometimes preferred when making recipes involving salad or sandwiches and when some additional flavour from the oil is need. Overall, the majority of people tend to be more health conscious these days and buy canned tuna in water vs caned tuna in oil. Then they add mayo, mustard, or some other garnishing for taste if they want.